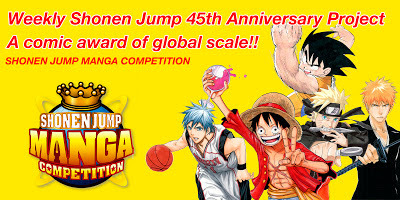 In celebration of Weekly Shonen Jump's 45th anniversary it was officially announced that Shuesiha (publisher of Jump magazines) are launching the biggest and greatest shonen manga competition. For this epic competition, Shueisha will accept entries in Japanese, English or Chinese via the web. Grand Prize will receive 500,000 yen! Prize-winning entries will be promised publication in Jump in Japan or one of its special edition issues and/or the North American edition of Jump, OK! Comic in China, or Formosa Youth in Taiwan. Submissions will be accepted via the web. Entries may be 15, 19, 31, or 45 pages long. Submissions will be judged by Shueisha 's Shonen Jump editorial department and the editors-in-chief of the participating publications. A reader popularity poll on the official website will also be taken into consideration. The e-mail of register confirmation will be sent to your e-mail address. When the URL in e-mail is clicked, your registration is completed, and ”My page” will be opened. Select the manuscript file at the contribution form in “My page” images, and fill out the requested items such as your Pen Name( pseudonym ). After that, click “Upload”. The confirmation screen will appear, which means your uploading be completed. Competing entries will be announced in November and be available to view online between November and December. The winners will be announced between December and early 2014. No age limit has been issued by the organisers. That basically means, that people of all ages can apply.